Water Hyacinth is one of the fastest growing plants known. Its primary means of reproduction is by way of runners or stolons, which eventually form daughter plants. It also produces large quantities of seeds that are viable for up to 30 years. Because of water hyacinth’s ability to quickly reproduce, populations often double in size in just two weeks. 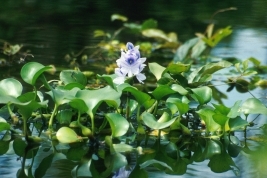 In the North America, water hyacinth is considered an invasive species. When not controlled, it will rapidly and thoroughly cover entire surfaces of lakes and ponds – dramatically impacting water flow, blocking sunlight to native submerged plants, and starving the water of oxygen; often killing wildlife such as fish. Water hyacinth is an aggressive invader and can form thick mats. It is very important to control water hyacinth before the entire water surface is covered. In Florida, water hyacinth once clogged up and choked a major waterway. Water hyacinth control is difficult. The most effective methods of control rely on prevention. Make sure to control the nutrient levels in your pond or lake to prevent the rapid and explosive growth. Do not introduce water hyacinth to new ponds unless you are willing to monitor it and take action if its growth gets out of control. It is advised that you only introduce water hyacinth to your own personal ornamental water gardens. Introducing it into natural water bodies is asking for trouble. When harvesting or otherwise removing water hyacinth, do not discard it in a natural water way, instead put it into a compost pile. The herbicide that recommend using for Water Hyacinth control is Glyphosate 5.4. This herbicide should be sprayed onto the plants. Water Hyacinth is a floating perennial plant that is native to the Amazon and has spread to much of the southern united states. It prefers warmer climates and has board, thick, and glossy leaves that are 10-20 cm across. The hanging roots of the plant feathery and purplish-black in color. Water Hyacinth can grow in height to as much as 1 meter above the surface of the water. It is supported by an erect stalk that has a single spike of 8-15 flowers. The flowers are usually lavender and pink in color and have six petals. Water hyacinth has no known direct food value for wildlife and is therefore considered a pest species. However, the hanging roots are often inhabited by invertebrates, which are in turn eaten by other aquatic species (amphibians, reptiles, etc). Water hyacinth is popular among owners of ornamental water gardens because of its beautiful flowers and tropical appearance. However, due to control difficulties, we do not recommend the introduction of water hyacinth to natural water bodies. If you observe it growing in your pond with out your doing, you should take steps to eliminate it before the plant takes over the entire water body.